This year, it’s Receipt Bank’s turn to take the stage. Between the 3rd to 5th April 2019, we’re taking a select group of accountants and bookkeepers to the Great Barrier Reef, for three days of educational masterclasses, networking and excursions. So why now? 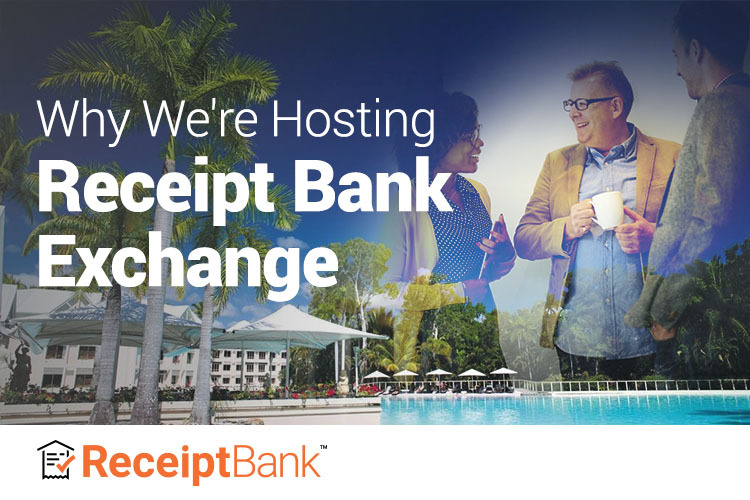 Here are three reasons why we decided to host Receipt Bank Exchange Australia this year, and how this is all a part of further celebrating our accounting and bookkeeping partners. One thing that has set Receipt Bank apart from day one is the talent and enthusiasm of our partners. Just read some of their stories here. Some have been with us from the very beginning, when we were founded in 2010, having tried Receipt Bank in its infancy and trusted us enough to join us on the journey. Others joined recently and are already transforming their lives – both professionally and personally – with the amount of time saved. Now, nine years after we were founded, we want to reward our partners both old and new. Last year, we launched Orange Select, the very first partner rewards programme and the leading incentivised advocate programme in the industry. This was the first step to start rewarding accountants, but we knew there was so much more we could do. Now that we’ve brought more than 4,000 accountants and bookkeepers together online, the next natural step is to bring them together in person. 2. Stay up-to-date on the accounting industry. In the accounting industry, change comes thick and fast. Receipt Bank Exchange Australia is your opportunity to stay up-to-date with industry trends and better understand a landscape where change is the only constant. The accounting industry has completely transformed in the last decade. According to a 2018 research report, 67% of accountants believe cloud accounting software makes their life easier, and improves the lives of their clients. That’s compared to 2010, when cloud technology was still an abstract concept with little market appeal. Receipt Bank Exchange is also meant to show what’s possible. Do you want to gain greater control over your life and business? Do you want to increase your profit margins so you can take your family on holiday once or twice a year? By using the very best ecosystem that cloud accounting software has to offer, and applying it thoughtfully and strategically to your practice, you can take the future in your own hands. But it’s not all about work. When you work so hard, you deserve to play hard too. 3. Work as hard as you play. Automation brought about by cloud technology promises a happier work-life balance, giving you and your team more time to do what you love. That’s why Receipt Bank Exchange will be combining the best of both, with educational masterclasses, inspirational keynotes and a selection of excursions - from sunset cruises to snorkelling in the Great Barrier Reef. What’s more, you will spend three days in the gorgeous Sheraton Grand Mirage Port Douglas resort with industry colleagues where small conversations may spark some of your best ideas. There will be plenty of opportunities for networking with a select group of leading accountants and bookkeepers, to share stories and learnings. And that’s why we’re holding Receipt Bank Exchange Australia. To bring together like-minded people, in one of the most beautiful places in the world, to explore how to work smarter, grow faster and go further with cloud accounting technology. We hope to see you there.